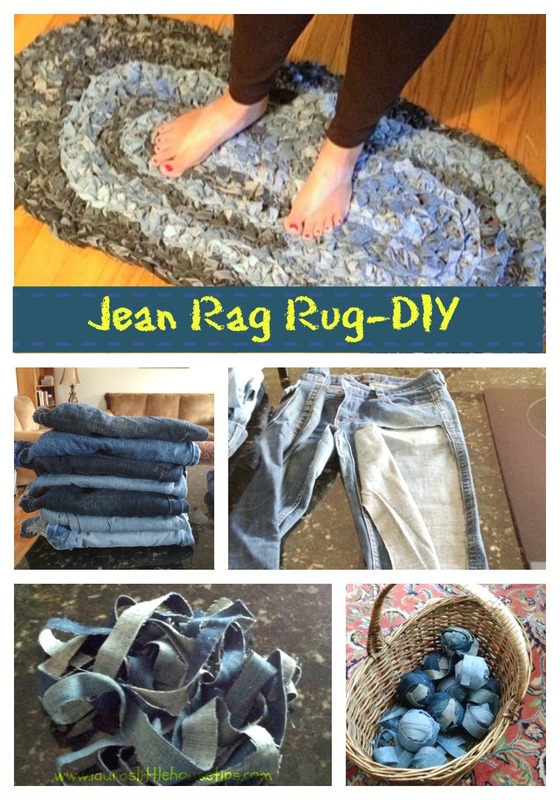 Denim Rug: Give Old Jeans New Life! Doesn’t that sound fresh? If allowed, the idea of repurposing items can really kindle creativity in a person! 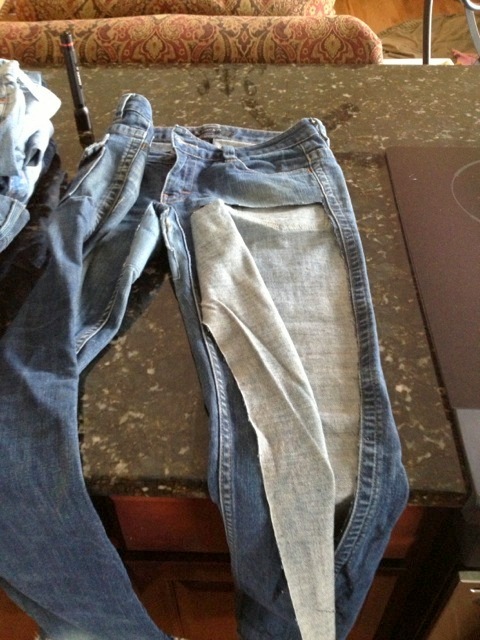 I found myself growing a pile of old jeans – too small, too worn, too torn. You name it. I decided to make a throw rug with that pile of jeans and I am so glad I did. 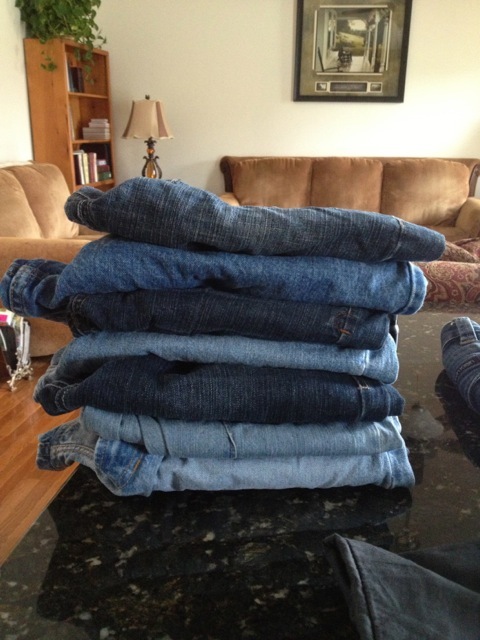 I began with 9 pairs of various sized jeans. I cut the main sections (4 panels each pair) avoiding all seems. 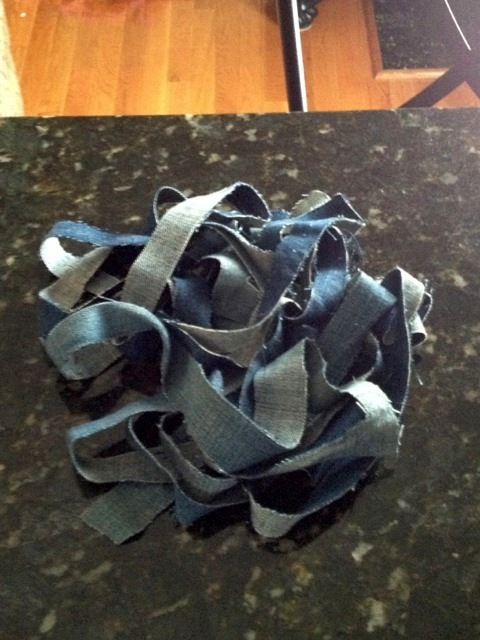 Then I cut them in one long continuous strip. Cutting up one side and when I reached within 1/2″-1″ of the end of the panel, I turned the denim and cut back down to the other end. So excited to get things moving along… but still had more prep work to do. Imagine 9 pair of jeans X 4 panels each, cut into piles of this “yarn”. Only one thing would preserve sanity in this situation. Roll all 36 strands into balls. I carted this basket with me everywhere. When I had quiet moments waiting for appointments or children’s lessons to finish or during a quiet workday, I rolled. And eventually I grabbed an extra large crochet needle and started in! I just kept stitching in an oval shape and now my feet have a cozy, chunky, durable Denim Rug right in front of my kitchen sink! I love it! I will never look at a pile of ‘toss out’ items the same again. I am proud of my denim rug, it always attracts attention, and all it cost me is a little imagination, patience, and initiative! I hope this fuels your own repurposing endeavors… here’s to new life! I love those planters! Hens n chicks are my favorite! Awesome idea! I need a new rug in the kitchen and those muck boots are fantastic! I was wondering how to find out what the width of the strips is? I love to repurpose items and jeans are one of my faves!! Love the way your rug turned out! Great job! I don’t understand how to make the jean rug. Can you explain how to make the pattern? How did you attach the stand together? Crocheted, or sewed? I guess for people like me it would be nice to see some in progress pictures. You just jump from a bowl of denim balls to finished product. Why no steps or examples? Dropping by from the Sunday Blog Hop. Thank you so much for sharing this great DIY! I love seeing repurposed projects like this. You are so creative! Terrific rug and fantastic imagination! I am going to try this one after I have saved up a few pairs of denims. My daughter could cut and roll. Until now we have generally tried crafts from Jumpstart Crafts or Kids Crafts. In fact if my daughter’s interested, she could participate in the actual making of the rug. Your rug is a lovely craft for us to start our first mother-daughter craft project. Many thanks! I love, love, love this idea! 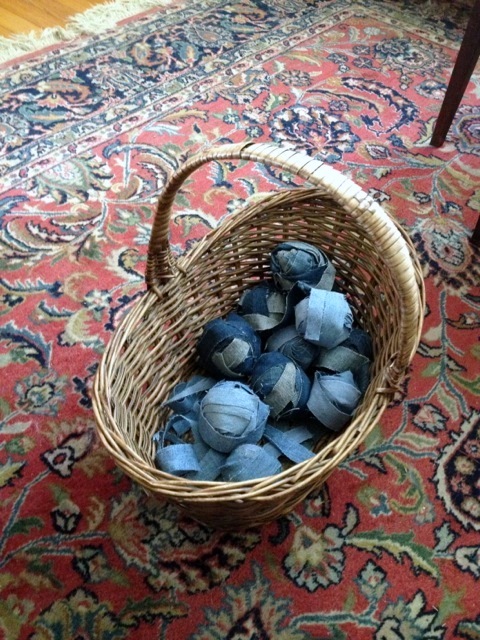 It is fabulous that you repurposed old jeans and gave them into a pretty rug =) Thank you for sharing this on our Welcome Home Wednesday link party! You get my vote for the feature next week! Make sure to come back next week to grab your button! Good Morning!! Just popping in to let you know your post has been picked as a feature at the Welcome Home Wednesday Link Party! Stop by this morning to see your feature and link up! Don’t forget to grab your “Featured Button” too! Sounds like y’all know each other. I have to say that I don’t feel I have enough info to go on here. When you say you took a large crochet needle and got with it; that tells me nothing!! I need to know how big the needle is, what Letter or Number is the needle??? And you gave no directions what so ever!! and perhaps do some gift giving with them. I am a beginner at chrochet but will try to follow along. That is my favorite post. 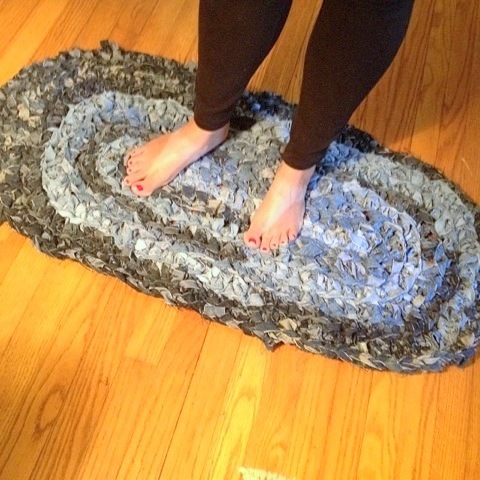 These rugs get softer and softer and are so fun to make. I look forward to see what you make. Thank you so much for stopping by our party! Vickie @Vickie’s Kitchen and Garden recently posted…My Menu this Past Week 10/3/15 -Time for Sauerkraut! What a great way to repurpose old jeans. I almost always have a few sitting around that the kids have worn holes in or grown out of. Thank you for co-hosting #HomeMattersParty. I love our Denim Rug. It gets softer each time you use it. I have 4 in my home and love each of them. what pattern did you use to make the rug after you got the balls? What pattern or stitch did you use when you got the balls together to make the rug? The largest you can find. Mine is blue but does not have a size on it. How wide is each strip? I am thinking it would be a good idea to cut the jeans with pinking shears so that when you wash the rug it will not ravel. How wide are your strips? How are these rugs to wash.
After get a large crochet needle and stitch in an oval—–I’m completely lost. I would love to understand how to do this. How wide are the strips are they 1 inch or 1 1/2 inch or two inches? I love the idea of the jeans rug. Many people have asked but I haven’t seen a reply on how wide the strips are.. does anybody know??? Is there a crochet pattern that you used to make it oval?